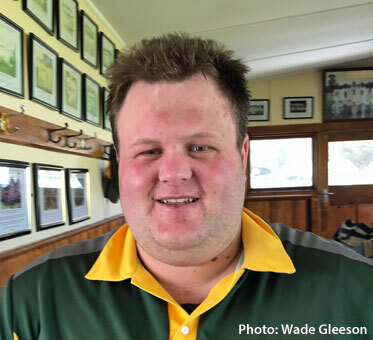 THE Southern Cricket Association season got under way in great conditions at the weekend, with the Twenty20 Super Bash matches starting on Saturday. A match-winning innings of 97 from New Norfolk I batsman Stewart Rice was the highlight of the triple header at Tynwald Park against Montagu Bay. Batting first, the Red Caps made the huge score of 4-180 off 20 overs. The innings from Rice was superb and included nine sixes and six fours. Rice put on 35 with fellow opener Rohan Heron (10), and then went on to a 100-run stand with newcomer Mathew Bowden who made 38 on debut, striking one six and four fours. Captain/coach Jason Rigby was 13 not out. In reply, the Sharks could only manage 9-88 off their 20 overs. This was down to some excellent bowling from the Red Caps. Nathan Rice took 2-18 off his four overs, Seb Wishart got 2-1 from two overs and Jamie Hill bagged 2-5 , also from two. Nathan Eiszele also did well taking 1-14 (2), while big hitter Stewart Rice got in on the action, taking 1-24 off four overs. In Second Grade, Molesworth I defeated Gretna I by 19 runs at Gretna. Batting first after being sent in, Molesworth scored 7-122 off its 20 overs. Openers Josh Ransley (21) and captain Brayden Hodge (14) put on 30 for the first wicket. Brad Coppleman found early form, scoring a very entertaining game high 56. Coppleman hit fives sixes and three fours in his innings that really set up his team’s winning total. Coppleman was out with the score on 2-103 when he was well stumped by Gretna keeper Glenn Blackwell off the bowling of Zac Crosswell. Daniel Coppleman scored 14. The main wicket takers for Gretna were Craig Cunningham with 2-5 off two overs and Peter Jelkic 2-29 off four. In reply Gretna finished 9-103 off its 20 overs. Rhys Browning top scored with a good 35, that included two fours and two sixes. Vice-captain Todd Jarvis did well, making 21, and opener Glenn Blackwell got 17, including two fours. The Molesworth bowling attack did very well with young Jeremy Nichols taking 3-14 off his four overs in a great spell. Josh Ransley also did well with 3-17 from three overs and Brayden Hodge 2-22 from four. In Third Grade, New Norfolk II was defeated by Montagu Bay off the last ball of the match at Tynwald Park. With one ball remaining and the scores tied, the Sharks got bat on ball and scrabbled through for a single. The Red Caps were sent into bat and made 7-122 off 20 overs. Young Jye Bearman was the star of his team’s batting line-up , making an excellent 46 not out. Bearman hit three sixes and four fours in his innings . Will Banks made 27 (three fours), Aaron Triffitt 19 and opener Aaron Drew 12. In reply, the Sharks snuck home, making 4-123 off their 20 overs. Mitchell Rice tried hard taking 2-11 off three overs, as did Josh Rowlands with 1-9 off his four overs. Fourth Grade saw Gretna II go down to Bagdad at Gretna. The home side won the toss and batted first, making 7-104 off its 20 overs. Gretna was in early trouble at 4-17 , but a quickfire 38 from Jon Smith got things back on track. Smith’s total came from 13 scoring shots, hitting three sixes and two fours. Luke Crosswell did his bit down the order with a well-made 20 not out (two fours). In reply Bagdad finished 2-109 off 15.5 overs. Jake Campbell 2-19 (2) and Luke Crosswell 1-23 (4) were the wicket takers for Gretna. Well done to Matthew Coulson on his first game for Gretna. Matthew is the 301st player at the club since 1977-78 . Bushy Park forfeited to Bothwell in the other Fourth Grade match involving Derwent Valley teams. In Seventh Grade New Norfolk III started the day well in the triple header at Tynwald Park, defeating Montagu Bay by 29 runs. The Red Caps had first hit and looked like they would make a low score at 9-69 but a 44-run match-winning partnership between veteran Adrian Rowlands (31no) and Liam Kalbfell (6) got the Red Caps to 10-113 off 18.1 overs. Rowlands, who was a late inclusion, hit four sixes. In reply, the Sharks made 8-84 off their 20 overs. Stuart Muir bowled superbly, taking two wickets for just five runs off his four overs. David Mitchelmore , 2-28 (4), and Liam Kalbfell, 1-10 (4), capped off a great day. In the other Seventh Grade match, Molesworth II was no match for Derwent at Boyer Oval. The visitors had the first knock, making 6-132 . Liam Triffitt was the standout for the Molesworth attack, taking a game-high 4-24 off four overs in a great display. Jake Sorensen took 1-22 (4) and captain Sam Triffitt 1-27 (2). Mark Jablonski didn’t take a wicket, but finished with the very good figures of just seven runs off his four overs. In reply Molesworth, playing one short, finished 8-48 off 11.4 overs. Josh Nichols (13) was the only batsman to get double figures. Number 10 batsman Larry Menzie did not bat. Eighth Grade saw Bothwell II get off to a great start with a 19-run win over Brighton at Bothwell. The Bucks had first knock, making the good score of 4-134 off 20 overs. In reply, Brighton finished 5-115 . Bothwell opener Shayne Wood top scored with 39. Wood put on a 68-run stand with No.3 batsman Adam Clark, who made 20. Captain Blake Eyles made 27 not out and Stuart Eyles got 24. 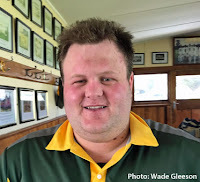 For the Bothwell bowlers, Mathew Glover was the main wicket taker with 3-31 from four overs, while Peter Hansch took 1-19 (4) and Simon Eyles 1-18 (3). AFTER forfeiting to Bothwell in their Fourth Grade match at the weekend and also next weekend against Gretna, the Bushy Park Cricket Club is looking for more players. The club has one team and is struggling for numbers. Old and new players are invited to come along for a game. Training is on Thursdays from 5.30pm. For more details call Shaun Fenton on 0418 839 688.